AFAIK, the only state that ties inspection to registration is NC. In NC, there no longer is a physical "sticker" on the windshield, but rather you must have the car inspected which, if it passes, means the garage enters that in the DMV computer, during the 60 days leading up to the renewal. No inspection - no renewal. NC did away with actual stickers 10 or so years ago. Here, in WV, inspections have nothing to do with registration. You are supposed to have a valid "sticker" but probably 1/4th of cars don't. This has nothing to do with the registration. The car comes new with a sticker, so that is the month the car was delivered to the dealer (and thus a way to tell if a particular one has been on the lot a while and they might want to give you a deal) and, if you obey the law, will keep that month forever. It has nothing to do with the month your plate will expire. Oddly a June plate expires June 1, with a June sticker expires June 30. I think PA is the same. I have seen cars with expired PA stickers, IIRC. If I have my fact straight, this is also true of Pennsylvania: no county name, no registration sticker, no windshield sticker. And they are the only two states that have completed ditched stickers. Pennsylvania uses windshield stickers to validate the inspection (safety checked statewide and some counties check emissions as well--they use a second sticker to validate it). But you are correct that they've done away with plate stickers. And to my knowledge, they've never put the county on their plates or on a sticker that goes on the plate. So I guess the inspection sticker acts as a stand-in for the registration sticker. Makes sense. I'm assuming you can't renew your registration without having your car inspected (?) . Incorrect - While they check your registration at the inspection station, they don't check your inspection when getting your car registered. The only thing you need to get the registration renewed is a valid insurance policy. And even then they take your word for it - you tell them your insurance company and policy number, but that could be an expired policy or even a fake policy...they don't do an on-the-spot check. You need a valid registration, along with license and insurance, at the time of inspection. For example: Your inspection sticker shows March, 2019. You are in the inspection station on March 30th, and your registration, license and insurance expire on March 31st. You still pass that part of the inspection. They will probably tell you to get your registration renewed, but emissions are the only thing they can fail you on if it's not properly working or valid at the time of inspection. Also, the inspection cycle is 2 years. The registration cycle is for one year. So even if I renewed my registration, it'll still expire on March 31, 2020, while my inspection is good until March 31, 2021. No. The inspection stickers in the windshield were in use when PA was still issuing plate stickers. They just stopped issuing plate stickers. As far as whether one renews the registration or has it inspected first, I'm not sure. For PA, typically the expiration date of the registration is a month earlier than the expiration date of the inspection sticker(s). So the registration renewal indeed comes first. It's also worth noting that PA now allows the option of renewing one's registration every two years rather than every year. The inspections are still annual regardless of which registration renewal interval is chosen. So, from what I'm understanding now, there is no way in either NJ or PA to tell if a vehicle has current registration. I know Pennsylvania, when that state stopped issuing stickers, said there's no need for stickers anymore, since everything is in the database. So why do all those other states continue to issue them? Guess on my part; when they say database, such only involves PennDOT & vehicles registered in PA. Other states may not have as elaborate of a database. It's worth noting that PA & NJ aren't the only states that don't/no longer use plate stickers. NY hasn't used them in decades if ever. I believe there's a few other states that don't use plate stickers either. All other states I've found that don't use plate stickers use windshield registration stickers instead. The trend is against using visible markings on the vehicle to indicate current registration and instead relying on ANPR and live connections to the vehicle registration database. In Britain, for example, DVLA eliminated tax discs a few years ago--police forces now rely on ANPR to check that a vehicle on the public highway has current VED. Are you sure those windshield stickers aren't just inspection stickers? It might vary depending on which state. Not 100% sure, but I did a cursory search for all 50 states plus DC. Pennsylvania and New Jersey were the only odd ones out. At least in NY, we have both windshield inspections stickers and windshield registration stickers (except for government vehicles, which have only inspection). Connecticut switched from plate stickers to windshield stickers in 2006 because of partial plate thefts. Connecticut then abolished the windshield stickers in 2010. Ah, thank you. Yes, if a state switched to windshield registration stickers and later abandoned those as well, then I didn't have a simple way of finding that out. Such was one of the reasons that ultimately lead to PA abolishing their plate stickers. Many plates, mostly in the Philly area, were getting clipped at the corner where the registration sticker's located. I seem to remember cars in Philadelphia county having reg stickers on the windshield, or somewhere else on the car a few years ago....I think it was down to the theft issue they were dealing with at the time. You're thinking of the short-lived yellow Post-It like stickers placed on the rear windows. Such was done on an experimental/trail basis only for vehicles registered in Philadelphia (where the majority of the plate clippings were occurring). It was dropped because the adhesive didn't last too long (the sticker would fall off) and it encouraged vehicular and/or traffic-stop profiling. I imagine the profiling issue would go away had it rolled out statewide. The adhesive issue seems like the bigger problem, though not unsolvable had they wanted to go that way. Missouri was having this issue as well, and their solution was to locate the sticker in a well in the center of the plate, between the two halves of the plate number. So it looks something like "A55[sticker]RGY". Oklahoma's apparent solution to this is to just not bother to ticket anyone with expired plates, so there's no need to steal the stickers. Given the overall size of PA, choosing one county (Philadelphia in this case) to experiment with a new item seemed to be the right & prudent choice. The reason it was chosen over the other PA counties for the experiment was obvious; the majority of the plate clippings were occurring in Philly. Had there been no issues, be it profiling or the adhesiveness of the Post-It stickers; the new stickers would've then been implemented statewide. IMHO, all of these "plate clipping" and simple plate theft stories seem to be a sort of mass panic. Since even the most backward jurisdictions can read plates electronically and relate them back to a data base in real time, there really is no reason to do so. My point is that, had it gone past the experiment stage and rolled out statewide, the profiling issue would have vanished into oblivion. And, after all, it's not like the adhesive issue can't be fixed. No sticker at all is certainly easier, though. I wish NY would join CT, QC, and PA in getting rid of them. My point is that, had it gone past the experiment stage and rolled out statewide, the profiling issue would have vanished into oblivion. Since then, more and more new vehicles now feature dark-tinted rear-windows so such stickers would not be able to be seen/readable from a distance. I wish NY would join CT, QC, and PA in getting rid of them. I'm assuming you're referring to window/windshield stickers. I've never seen a NY plate with stickers on them. Yes, the windshield stickers. They can be a bit of a pain the change. Fun fact: NY government plates actually have stickers on them, but all they do is show the county the vehicle is from, and they're the same color scheme as the rest of the plate, so they're not really noticeable as stickers unless you get really close (or happen to see a plate lacking one). The new issue of Car and Driver that came yesterday has a one-page piece about the Rplate digital plates. A couple of the features they mention are interesting enough in concept—for example, having it synced up to mobile parking payment systems like ParkMobile so the plate will display that you've paid for parking until a specific time. To me that's not worth either $499 or $799 for the plate (the latter version includes upgraded telematics that let you—and Big Brother—track the vehicle online) plus another $99 a year to keep the plate online. As the article notes (third set of brackets in original): "... [Neville] Boston [Reviver Auto's CEO] says owners will control whether the Rplate shares their data. 'If it's something you want as a functionality, we support it with our current model,' he says. 'You can absolutely turn [data transmission] off. It's controlled by the user. The owners of the plate own their data.' If that sounds familiar, reference Facebook's terms of service circa 2018—nominal ownership often isn't enough to prevent companies from sharing data." Regarding windshield stickers, in DC they've combined registration, safety inspection, and residential parking permit all onto the one sticker. When they first did this, discontinuing the license plate stickers, DC parking enforcement started giving people tickets for having expired plates, so the city issued supplemental stickers that said "See Window Sticker." 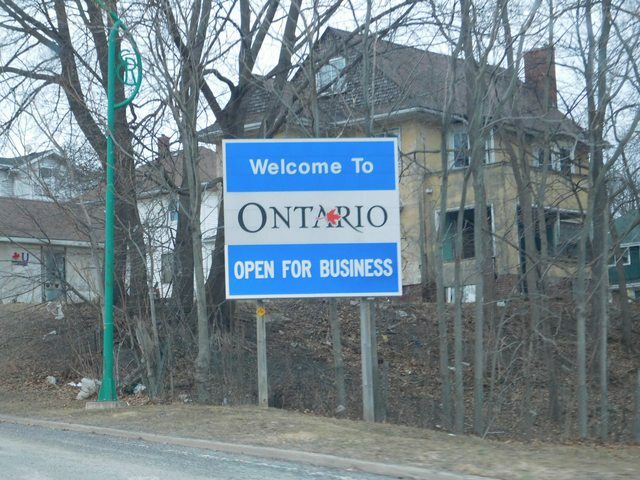 Ontario's passenger vehicle plates are changing to "A Place to Grow" and commercial vehicles are changing to "Open for Business" (Doug Ford's slogan that he added to the border signs - here's an example at the Rainbow Bridge in Niagara Falls). Ontario is also considering ditching front plates (currently there are only 4 provinces with front plates). Open for business? As opposed to what, a centralized fascist government that controls the means of production ("get lost")? Dumb slogan. Used by various US states as well. I hate them all.